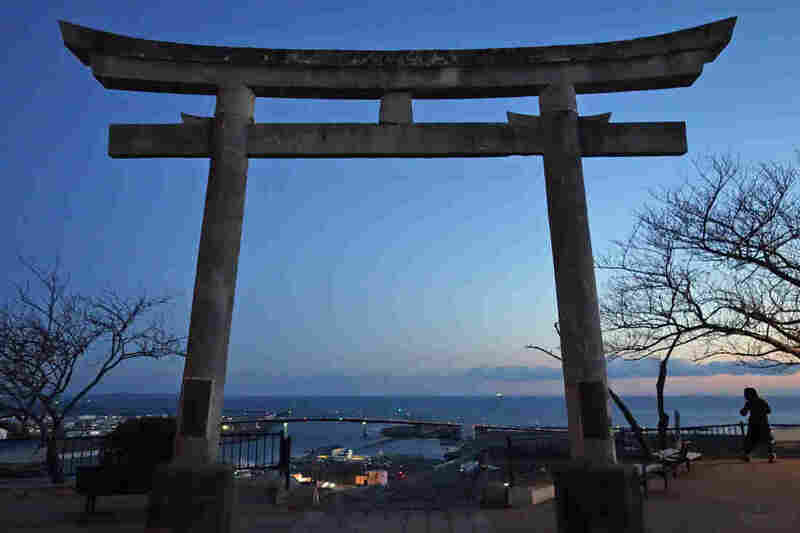 After Tsunami And Quake, A U.S.-Japan Partnership To 'Give Hope' : Parallels When the earthquake, tsunami and nuclear crisis hit Japan in 2011, U.S. troops delivered aid in Operation Tomodachi, Japanese for "friends." Another Tomodachi program brings Japanese kids to the U.S. In a photo from March 2011, then-U.S. 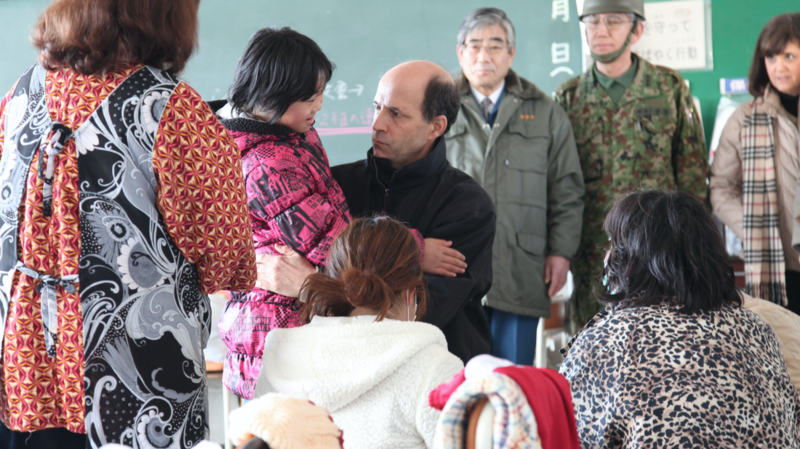 Ambassador to Japan John Roos visits the Tohoku region, hardest hit by the tsunami and earthquake. He and his team then started the Tomodachi (Friends) Initiative to help young survivors. For Natsumi Miyakawa, a young resident of Japan's Tohoku region, March 11, 2011, should have been a day to celebrate. It was her junior high school graduation day. Instead, there was chaos and sadness. "Everything was scary," she recalls. In the coastal city of Ishinomaki, where she now lives, 3,700 people drowned in the tsunami resulting from a magnitude-9 earthquake. A hilltop saved lives. "People came to escape to this hill," she says. "And there is a kind of legend that has been passed down generation to generation that said when a tsunami happens, just escape to here." A Shinto Torii gate sits atop a hill in Ishinomaki, where 3,700 drowned in the 2011 tsunami. Many fled to the hilltop to survive. In the nearby town where she and her family lived, Miyakawa spent 10 days after the tsunami living in her school's gymnasium, which was turned into an evacuation center. She cleaned toilets and floors, filling buckets with water from the school swimming pool. She helped elderly evacuees who were huddled in the gym. Her parents had left her alone at the evacuation center as they rushed around the disaster zone, searching for electricity to power the respirator for her brother, who suffers from a heart condition. 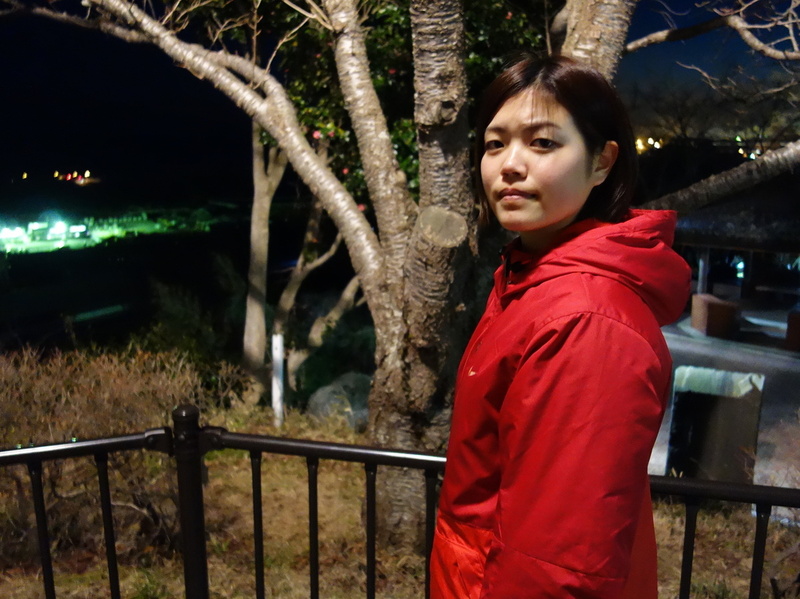 Earthquake survivor Natsumi Miyakawa, 20, is now training at Ishinomaki's Red Cross hospital to be a disaster nurse. "Actually, I didn't want to stop," Miyakawa says, "because once I stopped, I know I would start thinking about really negative things." John Roos, the U.S. ambassador to Japan at the time, remembers it well. "Never, never experienced anything like it," he says. "And hope to never experience anything like it again." Roos visited the region soon after the earthquake and tsunami, and remembers a conversation he had with the mayor of Rikuzentakata, another hard-hit town. "Mayor [Futoshi] Toba said to me, 'Our government is responsible for rebuilding our schools, our houses, our infrastructure. But the one thing that you can do is to provide hope for our younger generation here in the Tohoku region,' " Roos says. That conversation sparked a U.S.-Japanese project that continues today — the Tomodachi Initiative, which links the youngest survivors, many of them orphaned by the earthquake and tsunami, with cultural and education opportunities through exchange trips to the U.S.
With fundraising led by the U.S.-Japan Council, Japanese and American-based businesses and organizations have donated $50 million to Tomodachi Initiative programs. The exchanges send Japanese students to the United States and American students to Japan, for stays ranging from several weeks to full semesters. Volunteers host program participants in their homes. Of the thousands of young people who have taken part in exchanges, 70 percent are from Japan's hardest-hit Tohoku region. Roos says many students from this part of the country would never otherwise have been able to learn English or spend significant time in the United States. "The one thing each of those children had in common was that they had suffered a terrible loss," Roos says. "And so, part of it was to just give them a break from the day-to-day lives they were experiencing. But the other was to give them hope about their future." Miyakawa is one of the 29,000 individuals who've taken part in the programs or events put on by Tomodachi in the past five years. Now 20, she's pursuing a career in nursing, focused on disaster medicine. "After the disaster, I realized what it means to help someone," she says. "To do what you can, when you can." Through the Tomodachi Initiative's disaster nursing exchange, Miyakawa visited doctors and trauma centers in California and met with federal emergency management experts in Washington, D.C.
"In the future, I want to work all over the world for people fighting or suffering from something," she says. "Like disasters." That's an experience she knows and understands all too well. And from that experience comes her hope to help others. Akane Saiki contributed to this story.